In this chapter we describe how you can write, create and run IronPython scripts in the time cockpit system. If you want to write a stand alone program (e.g. an interface importing data from another system) that should not run inside time cockpit you can also use your favorite .NET programming language (e.g. C#). See chapter HowTo: Use C# to Access time cockpit API for details. To create a script for time cockpit you can use the built in script editor or any other editor of your choice (e.g. Microsoft Visual Studio). 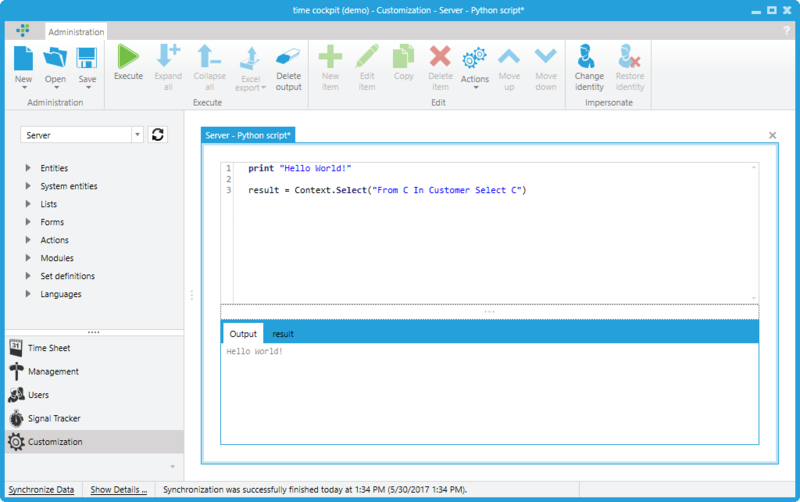 The built in script editor can be found in the Administration module. With the New button in the ribbon you can create a new script. You can save scripts in script files. IronPython script files have the extension .py. You can execute scripts using the Execute button in the ribbon or the F5 key. If you select a part of the script only the selected part of the script is executed. In the lower part of the script editor you see the output of the script. If your script generates a tabular result you can assign the result to the python variable result. If result is an IEnumerable<EntityObject> a result tab appears in which the content of the table is displayed. You can use all Python language constructs that are supported by IronPython. If you want to learn more about the language Python we recommend the documentation web site for IronPython. If you want to select a single row from the database use the SelectSingle(String) or SelectSingleWithParameters(String, IEnumerable<KeyValuePair<Object, Object>>) methods. The data model of your time cockpit installation can be changed as you need it to. You can change the data model either in the user interface or inside scripts. To access the model in a script you can use the Model property. The model returned by Model must not be changed. If you change anything in this model you will not be able to save your changes to the underlying database. If you need to have a writable model that can be saved use GetWritableModel to retrieve the model. GetWritableModel can only be called in a script that is running on a Server context because in a Client context the model can never be changed! The following sample script adds a new entity to the underlying model. Note that the model that should be changed is retrieved using GetWritableModel. The change is saved using the SaveModel method. Instances of the entities defined in your time cockpit's model are always instances of the EntityObject type. The previously mentioned Select(...) methods also return IEnumerable<EntityObject>. In your scripts you can access the members of the EntityObject instance by using their name. myObj.Description = myObj.Description + " extended"